Under the reign of King Philip II Augustus (1180-1223), the kingdom of France represented a mosaic of local mints. The lords (seigneurs ) struck feudal deniers of about 1 gram weight with a silver content varying from one region to the other, and from one year to the other. Merchants were well aware of these quality variations. Also, the clergy possessed their mints and thus, a denier from Mans (the mansois) was worth two of those struck in Angers or Tours (respectively : the angevin and the tournois). As for the south, the denier toulousain (Toulouse) was exchanged for two deniers from Melgueil or four from Le Puy. Coinage circulating in territories under King Richard the Lion Heart ( Oxford 1157-1199 Châlus) were deniers mansois and later, with his takeover of Normandy , the region shifted from the denier de Rouen ( city of Rouen—episodically the Normandy capital at that time) , to the denier Angevin. Meanwhile, within King Philip's domains, his deniers were prevalent, these being the denier of Paris called deniers parisis, similar in quality to the mansois and containing approximately 50 % silver which caused a problem since Plantagenet angevins contained only 32 %. Philip's coins were quickly vanishing on the market. To counter the problem and avoid the Parisians wrath were there devaluation of any sort, the king turned to the Abbey of Tours situated in Plantagent territory and whose tounois were already known. Holding title as lay Abbot of Saint Martin of Tours, the king ordered legends modified to read : Philippus Rex, thus creating competition for the angevin within the Plantagenet fold. It is theorized, but not yet proven, this manoeuvre took place during King Richard 's incarceration in Austria. Thus , the peaceful Abbey of Tours unwittingly became King Philip's Trojan Horse. Finally liberated, King Richard wasted no time sacking the abbey; expulsing it's clergy. In later years when his brother John ruled and lost territories to the kingdom under fief laws of " commise" (confiscation )-- John found himself left with only Aquitaine and Poitou -- King Philipe in turn lost no time decreeing "denier" laws throughout recuperated lands. "Let it be known, henceforth , within the king's lands, non are authorised, neither money-changers or any person whomever, to take forbidden coinage abroad. Such must either be exchanged or turned over to the law". This coinage was to be exchanged for "deniers tournois" and recycled into royal money. The French king pragmatically set aside reserves of "denier mansois" and English "esterlins" to serve when propitious. These were valued as double or quadruple Philip's "denier tournois ." A century later, 1328, Philipe of Valois climbed upon the French throne as Philipe VI rather than Philipe IV's great-grandson, England's Edward III , and this event, along with political concerns regarding the Guyenne region as well as Flanders, precipitated a war to endure 100 years. After Cassel, the French Kingdom lost one battle after another. To celebrate his victories, in 1344, Edward ordered gold coins issued from Guyenne, their legends proclaiming him King of France. Not to be outdone for brash, in 1341, Philippe had issued from Angers a most unusual coin ( for France ),the George florin ( le florin Georges ). This fine gold coin weighed 4,70 grams. It’s obverse detailed a helmeted Saint George clasping a cross-engraved shield . The saint is displayed on horseback, plunging his lance into an overthrown dragon's gaping mouth. At Montreuil-Bonnin, a principal mint-house placed well within the protection of a defended fortress distanced but fifteen kilometres from Poitiers, reissued this florin in 1346. Such choice of symbol was not only entirely new to France, but interpreted as high provocation towards Edward and England, their revered saint making it appear as if enemy England were the dragon to be skewered. Rex Anglie Heres Franciae (King of England, heir to France ). Amongst these issues is the superb Salut d'or--the gold Salut ( salutation of the Annunciation ) -- presenting the Annunciation by Angel Gabriel with a crowned écu bearing both Arms of England and France. This highly symbolic coin announces Henry's future child, anticipated unifier of both crowns-- Henry having wed princess Catherine of France. Meanwhile, Charles VI continued minting in the Paris , Saint Quentin and Tournai ateliers. King Henry died 1442, a few weeks before Charles VI, leaving an infant aged two named Henry VI , proclaimed as King of France. To these events of English kingships dominating France ,the disinherited Dauphin resisted, determinedly minting coins in central France and south below the Loire river, except of course in Aquitaine. Over these regions he yet maintained control, assuring all minting took place within close proximity of his rivals' territories. The disinherited Dauphin (later to become Charles VII 1403-1461 ) organized the minting of his coins in Orleans, Chinon, Figeac and Niort, thus gleaning his rivals superior coins possessing superior silver fineness. Once recuperated, the precious metal was adjusted to produce identical coins to those of his father (Charles VI),except with lower silver content. Only discrete coin markings identified these as the Dauphin's. Recuperated value difference assisted financing military expenses. In 1419 the Dauphin was obliged to lessen silver content all round. 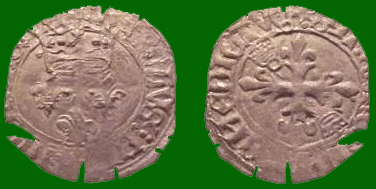 A florette (billon) of Charles VI or Henry V served to mint six florettes of low grade alloy, yet theoretically of like value. These were dispersed throughout the lands of his enemies. ABy 1429 , shortly before the battle of Orleans, Charles was reduced to minting low grade copper "jetons" keeping whatever quality coinage he could lay hands upon, to pay the troops. Only after the peace of Arras signed with Burgundy in1435 could he reinstate the kingdom's coinage. In 1450 Normandy was won back thanks to 40,000 ecus provided by the famed merchant Jacques Coeur and thereafter France gradually stabilized it's currency, thanks to this same merchant. Gold coins: pictures from "Catalogue numismatique d'un amateur d'art" by Françoise BERTHELOT et Jean VINCHON. Saint George singly graced this one historical occasion of French medieval coinage. Later, King Louis XI, the Spider King, ( reigned 1461- 1483 ) preferred gold coins bear images of Saint Michel vanquishing the dragon. Besides, memories of Montreuil-Bonnin's 200 royal moneyers massacred by English troops under the Earl of Warwick, (1346), was grief enough without distributing burnished reminders. Henricus Rex Francorum ( Henry, King of France ) .